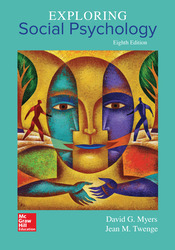 - Explores social psychological science and applies it to contemporary issues and everyday life. - Presents 31 short modules—each readable in a single sitting—that introduce students to such scientific explorations as love and hate, conformity and independence, prejudice and helping, and persuasion and self-determination. MODULE 2: Did You Know It All Along? MODULE 3: Self-Concept: Who Am I? MODULE 20: How Do Groups Intensify Decisions? MODULE 25: Do the Media Influence Social Behavior? MODULE 26: Who Likes Whom? MODULE 30: When Do People Help?